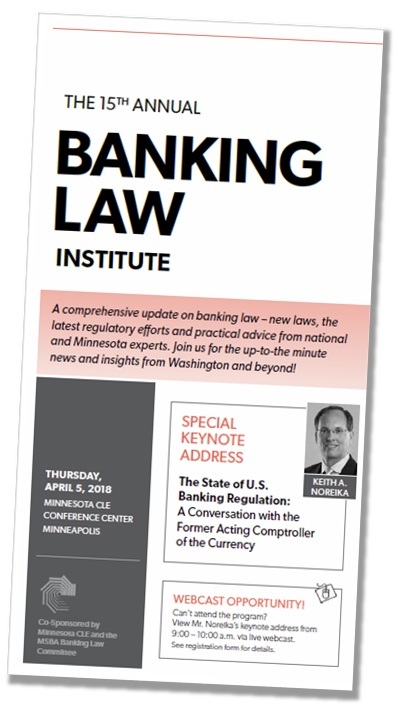 Get up to speed on the most important banking law developments at the April 5 Banking Law Institute. Don’t miss the moderated discussion with Keith A. Noreika, former Acting Comptroller of the Currency, on the state of banking regulation in the United States. #2 Outstanding Education and Expert Faculty! It’s the perfect chance to catch up with your friends and colleagues in a fun, informal setting – including lunch and reception! That’s why you have to have effective web based business home keep when it comes to taking items right your individual web-based online business. cash	????? You made some decent points there. I regarded on the internet for the problem and found most people will go along with together with your website. ??? ??????? ??????? ??????? ?